It's no wonder the 3B Barranco Bed & Breakfast Hotel has won the Best Bed & Breakfast in Lima on Trip Advisor for years in a row. We simply have the best guests staying with us, and customer service is our upmost value and importance. 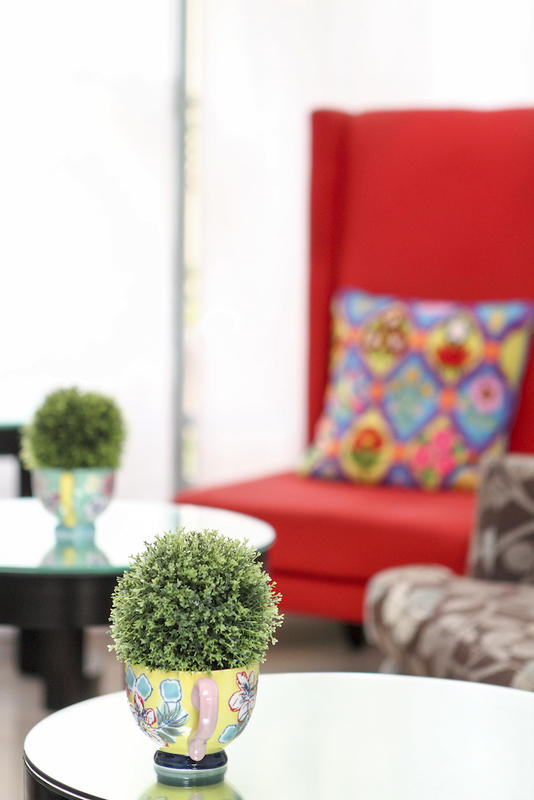 We believe we are your hosts for your stay in Lima, so our job is to ensure you have the best stay possible. Booking.com has also acknowledged efforts and we are proudly always above a level 9 out of 10 rating. With our tasty breakfast, comfortable rooms, close proximity to the ocean and friendly staff, we are sure your stay at the 3B Barranco Bed & Breakfast will be your best yet! Take a look below what our wonderful guests had to say about their experience at the hotel. Have you stayed with us before? Don't forget to share you experience on Trip Advisor! This is the third time that my partner and I stayed at 3B Barranco. We still enjoyed our stay here because the hotel was so clean and the service was fantastic. Breakfast was so delicious. The staff were friendly, polite, warm, professional and helpful! Special thanks to Elizabeth, Gloria, Carmen, Luis, Billy, the cook and the housekeepers for looking after us. My room was clean, the bed was comfortable, there was ample space for hanging clothes,and there was ample hot water throughout the day. There were several electrical outlets. The common area is on the first floor and and is where breakfast is prepared and served. You can also use the refrigerator and microwave.There are a number of delicious options for breakfast. There are stairs between the first and second floors, but no elevator. There is also room in the office area for temporary storage of luggage and a bath that can be used. The staff were all very helpful, friendly and efficient. I felt they went above and beyond; letting me borrow a transit card, arranging taxis from and to the airport, printing my boarding pass, providing a map of the area, steering me to locations for safe money exchange, giving me tips on good places to eat and side trips to take. The Barranco district is a nice area south of the airport and downtown. I was able to reach the downtown, by transit, in about 30 minutes. The time includes the 5 plus minutes to walk to the nearest station. It’s also about a 20 minute walk to the beach, via a highway overpass, and a 5 minute walk to the grocery store. "Staff were exceptional, very friendly and knowledgeable about the local area - local bars, restaurants, hints and tips etc. A very warm welcoming and these comments apply to both the daytime staff and the night staff. It's in a very convenient part of Barranco with a short walk to the local amenities and well placed for exchanging money also. The chaps down the road in the blue/green high visibility jackets give you good rates also.In terms of value for money, you can't beat it. The room was clean and tidy and the breakfast provided in the morning was very good. Would highly recommend this place if you are working with a budget." "3B was an immaculate, tasteful, and comfortable respite in the heart of the Barranco neighborhood. Excellent value and superior service made this small hotel our favorite during a recent 3 week trip to various points within Peru. There are several excellent cafes, small parks, and museums located nearby and it is an easy 20 minute walk along the malecon to the Miraflores district. This place is a winner!" Terri S. Seattle, USA, July 2015. "3B is exactly what it advertises: a simple, comfortable small hotel offering great value for the price. Our room was small but comfortable, clean, and quiet. Staff were very friendly and helpful - even packing us sandwiches for our early morning trip to the airport before the morning breakfast. And the included breakfasts were excellent - some of the best meals we ate while in Peru. Filtered water, coffee, and tea were available 24/7. All in all a great place to stay." "Llegamos con mi esposo a Lima a fines de Enero (2013) y seleccionamos 3B porque las opiniones ya eran favorables. Comprobamos en la práctica que si quieren visitar Lima el mejor lugar para alojar es éste. Aquí se comprende muy bien el concepto de Hotel Boutique. Sus habitaciones son hermosas, con luz natural y camas cómodas; posee una pulcritud que da cuenta de un espacio bien cuidado, los desayunos son exquisitos con buenas alternativas para elegir. La calidez de su personal, se refleja desde la prontitud con que responden los correos hasta la diaria atención. Entregan orientaciones claras y muy buenas para recorrer la ciudad, la sonrisa siempre está presente (esto es muy cierto y poco común), así es que te sientes atendida (o) como en casa. Sin lugar a dudas es el imperdible de Lima. De hecho, luego de recorrer el norte de Perú, volvimos por 4 días antes de viajar nuevamente a Santiago. Por todo esto, tenemos un sincero agradecimiento para todo el personal que forma parte de este Hotel. Si lo seleccionan, tengan por seguro que no se arrepentirán." "Chic and Artsy hotel, as advertised, has very comfortable rooms, nice bathrooms, an excellent staff, all in a very nice and quiet neighbourhood of Lima. Plenty of good restaurants and cafes close by and it is a short walk to the cliffs overlooking the ocean. Great views. Breakfast starts early and goes on till 11 am so you can sleep in and still get fed. You have a choice of made-to-order eggs or a vegetable sandwich or a bowl of fresh fruit with yogurt. Fresh squeezed orange juice and coffee and tea. The coffee is available in the lobby 24 hours. Free WiFi is available in the rooms. The hotel can arrange for an airport pick-up for a fee of $23. Barranco is far from the airport so the taxi charge is fair. A big thank you to the front desk staff for accommodating all our requests. It was a memorable stay." "This is no Basic Hotel or B&B! Boasting many Trip Advisor awards - this is a full featured hotel with first class service. We booked the taxi service in advance with the hotel from the airport (Recommended), the gentleman was so friendly and even gave us a mini tour of Lima. On arrival - there was a free map of the area and lots of great suggestions about where to visit and what to eat. The Hotel is situated in Barranco,(The bohemian suburb of Lima) ,there is lots to see and do. Local museums, eateries, mini festivals and an amazing corner bakery a few blocks down. Definitely explore all the independent food stores to find some great food. Miraflores is about a 15 minute walk away and its only a 5 minutes walk to the nearest commuter bus terminal. There is wifi throughout the hotel, free tea/coffee/hot chocolate 24 hours a day and always someone at reception. Rooms were very clean with a relaxing/zen theme of grey slate and bamboo in the bathrooms and courtyard, where you can take time out to read or enjoy a beverage. Complimentary breakfast cooked to order or what I would recommend is the fresh fruit salad, bright colours and mouthfuls of bursting flavour helped start our day. Contrary to the guidebooks - Lima (And certainly Barranco) are not dangerous. Just be sensible and look after your safety/valuables as you would in any Country. All the team were very happy to help and although we only stayed 4 nights before travelling to Cuzco, there was plenty more to see." "No wonder that it's ranked #1 on trip advisor. Perfect. Barranco is better located than Miraflores for our liking. You can reach everything by walking, beach, art galleries, very good restaurants just across the street and top notch wine bar. Fantastic. The B&B itself is very modern with lovely rooms, kept very clean by friendly staff. Breakfast is good and you can enjoy a cup of tea or coffee at any time during the day. The most beautiful part is the art display everywhere in the modern establishment. These gallery items apparently change from time to time. We arrived quite late in the evening and the friendly staff at the reception was very helpful to point us to a number of good places, where we still could get something warm to eat. We would go and stay at 3B Barranco's Boutique Bed & Breakfast again." "Este acogedor B&B fue simplemente fantástico! Gran servicio! habitaciones muy bien equipadas. Excelente relación calidad-precio! Básicamente todo genial. El personal era muy servicial y atento. El desayuno era sencillo pero bueno. Si algún día vuelvo a Lima, me alojaré aquí de nuevo!" "This place exceeded our expectations greatly. We only stayed in Lima as a stopover on the way to Peru, and we're not that interested in staying long. The truth is, this place and the surrounding neighbourhood made it a highlight. The staff are wonderful, the rooms are clean and quiet, they can arrange a transfer at a reasonable cost, wifi is included and there are kitchen facilities. Even when we had to leave early and would miss breakfast, they packed us a lunch to take on the flight! We really loved it here and have definitely made plans to return again someday"
"What a gem! The staff are all so helpful and friendly, the orange juice is freshly squeezed and eggs are cooked to order, and Barranco is a lovely area of Lima. Stay here and save your money for the wonderful restaurants of Lima and/or good causes. We will be back!" "Greetings, I like to thank you all very much for the wonderful job you did to make our stay comfortable while in Lima. We had a great time and your service was exceptional and wanted appreciate that." "Thank you, Overall I love your hotel and had a great stay." "Best service I've ever received in a hotel! They made us feel like we were really at home. And amazing breakfast every morning... can’t beat it. Thanks guys!" "Just wanted to say THANK YOU to all the staff... they were courteous, helpful and very friendly. A lovely place to stay while in Lima, Peru. I would highly recommend this bed&breakfast... I am missing the orange juice already!" "Hi Elizabeth and all the staff at 3B. Our extra special happiness was making new friends at 3B, Barranco Bed & Breakfast. Thank you very much for looking after us so well. Sending you a flower to let you know how happy we are to be back at 3b Barranco Bed & Breakfast." "Hi there... we wanted to thank you so much again for the great stay there." "Thanks you for making our stay in Lima such an incredible and enjoyable experience! We appreciate you making us feel at home and taking such good care of us. Thank You so much on behalf of all the University of Delaware Art Conservation Students." "Dear everyone at 3B! Thank you very much for all your help, advise and chats. We really enjoyed our stay here. Keeping touch and let us know if you are visiting London!" "Thank you for making our stay in Lima wonderful! I look forward to coming back! You are all very nice! I felt at home at Barranco BB! I miss it already!" "The staff was extremely friendly and accommodating. I've stayed at quite a number of hostels and it isn't often that you come across a hostel where all of the employees treat you as an equal, or, more importantly, a person." "Everything... the staff was SUPER helpful with information, luggage, opening doors for you, anything you asked for they tried to get! We had to leave the last morning at about 5:00am and someone got up and fixed us a lite breakfast! Thank You! I Have stayed at many 5 star hotels and this was just as nice if not nicer than some! It was also immaculate. If you are into Modern design you will especially love it!" "This place is more fancy hotel than hostel. The rooms were immaculate, with TV, hot showers, mints on your pillow, etc. There is no partying going on, but the service is superb at a great price. Definitely recommend to couples or older folks." "Gracias por haberme hospedado en su lugar. Muy lindo, me encanto, pienso regresar el proximo mes asi que les avisare con tiempo. Gracias." "It was not quite a Hotel or a Hostel but the best place to stay in Lima. At the front desk the staff was lovely and pleasant and had a wonderful smile and was inviting to all guests." "De nuevo gracias por la hospitalidad que nos brindaron, ustedes nos hicieron sentir como si estuviéramos en casa. Les deseo mucho excito y si algún día regresamos a Lima estaremos en las 3B de nuevo." "Really liked our 1 night stay there. Very clean and the staff are really friendly!" "Had an extremely pleasant experience staying at the 3B for our stop over in Lima before heading back to the states! The staff was so very helpful and the 3B was beautiful! Highly recommend a stop over at the 3B when traveling through Lima!" "Worth it! The best place ever. the best staff, so fabulous and unique..."
"The staff was so kind to me, I really hated to leave! I had the best time at your place- Thank you for all your hospitality, it felt like home to all of us, I know we all will always fondly remember the time we spent with you, and all of the memories created at your great place, forever in my heart...."
"Hello Everyone at 3B! Hope you all are doing well -- we certainly miss being in Peru! I thought I'd send along a few pictures that we took on our last night." "Thanks again for such a great stay and making me feel at home while I was sick. It meant the world to me! Take care and hope to be back in Lima sometime soon!" "He tenido el placer de quedarme con dos amigos en su hotel hace unas semanas; Solamente le quería comentar que me encanto el hotel y sobre todo su sencillez y amabilidad; realmente pocas veces en mi vida he encontrado gente tan amable. Muchas gracias, cuando vuelva a LIMA no dejare de pasar por el hotel. "Joanna & the best staff E.V.E.R!!! Words can not express how wonderful our experience at your Bed & Breakfast was. We are planning on coming back to visit again & we will be staying with you and you only!! Joanna, our tattoos are incredible! Thank you for your recommendation. We will never forget you all . Will see you soon. "The staff at 3B Barranco went out of their way to help. 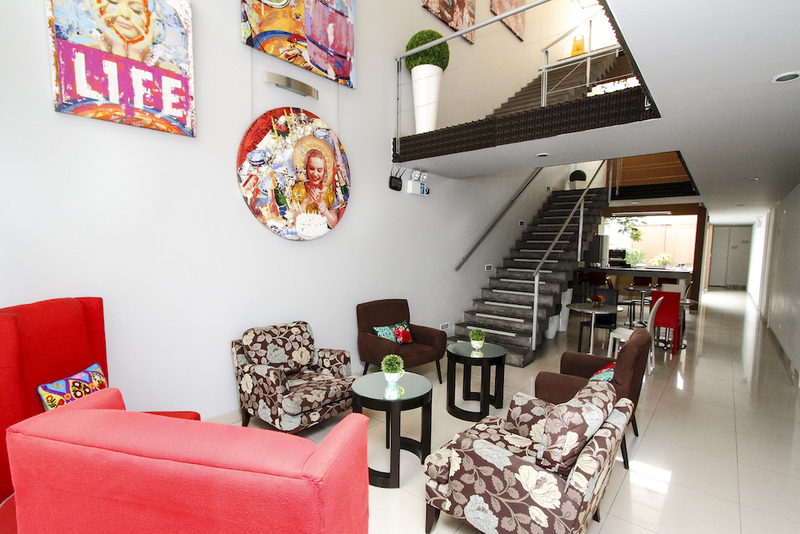 The hostel is new and a great design and being located in Barranco is close to a very interesting part of Lima." Elizabeth - Australia, January 2010. "The staff is friendly, the rooms are immaculate and it's a good deal for the price." "I stayed in 3B for 1 night on Dec. 3rd while there was a discount price. It's a good choice before leaving Peru, and people there were all helpful and nice. I enjoyed the bar in the kitchen very much (with plenty of coffee)."